About two million years ago, a new set of fossils began to appear in the human fossil record. Designated as Homo erectus, they show evidence of increases in both body size and brain size. Homo erectus is arguably the earliest species in the human lineage to have so many human-like qualities. Earlier hominins had important similarities with living humans, like bipedality, and H. erectus still had a long evolutionary path to become like you and me, but the fossils assigned to H. erectus display a number of new and distinctly modern human traits. Homo erectus is often referred to as the first cosmopolitan hominin lineage, meaning the first hominin species whose geographic range had expanded beyond a single continental region. While fossil remains from H. erectus are found in Africa, like those of earlier hominins, they have also been identified at fossil sites widely dispersed across Eurasia (Figure 1, Table 1). 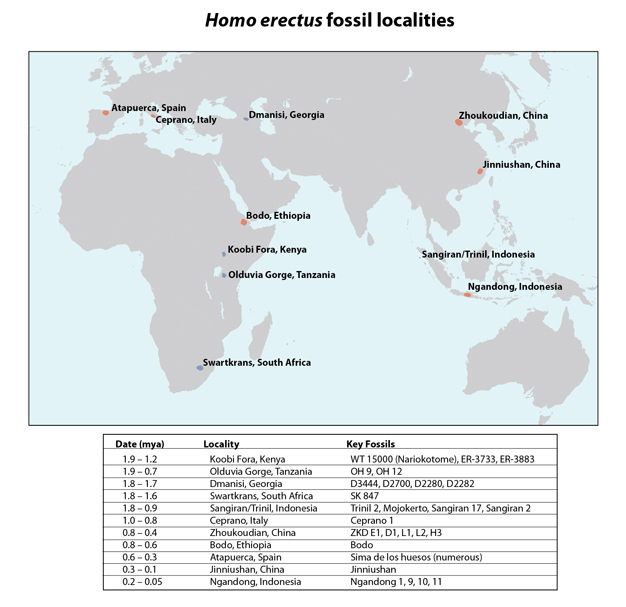 Figure 1: Map of Homo erectus fossil localities. © 2012 Nature Education All rights reserved. Table 1: Key Homo erectus fossil sites. A partial list of key Homo erectus fossil localities, and some of the key specimens preserved at each. Exact dates are difficult to obtain for many of these localities, so the above dates represent best approximate ranges. In some cases, such as Olduvai Gorge and Koobi Fora, fossils have been recovered from many individual localities within the area, spanning a large range of dates. There are a number of fascinating evolutionary questions that can be asked of H. erectus. The species was not only geographically widespread, it also had a long temporal span in the hominin fossil record (Antón 2003). With its earliest appearance in the fossil record from localities in the Lake Turkana Basin, Kenya, sometime around two million years ago, H. erectus populations persisted until near the end of the Pleistocene, as evidenced by fossils from Southeast Asia. Homo erectus thus presents paleoanthropologists with the challenge of trying to interpret fossil variation in the context of both widespread geographic and temporal distribution.